Photokina 2010: Pentax has announced its 645D medium format digital camera will start shipping globally from December 2010. The camera will sell at a retail price of $9999.99 for the body in the US. In the UK, it will be priced at £9000 for the body and £10000 for the kit with the DFA 55mm 645 SDM lens. The first digital version of the company's 645 medium format camera system, it features a 40MP, 44 x 33mm CCD sensor, 921k dot 3.0" LCD and is compatible with the existing 645 system lenses. PENTAX Imaging Systems is pleased to announce that the PENTAX 645D interchangeable lens, medium-format digital SLR camera will be launched in the UK in December 2010. The PENTAX 645D has been developed to provide super-high-resolution images, produced by large image sensors, to serious landscape and outdoor photographers. It combines exceptional image quality with excellent manoeuvrability and outstanding reliability to simplify professional-level outdoor photography. With the incorporation of a large, high-performance image sensor (measuring 44mm by 33mm) and PENTAX-original image-processing technology, the 645D produces extra-sharp, super-high-resolution images with approximately 40 effective megapixels. The PENTAX 645D is also compatible with all existing PENTAX 645 lenses for an easy move to digital for existing PENTAX 645 owners. 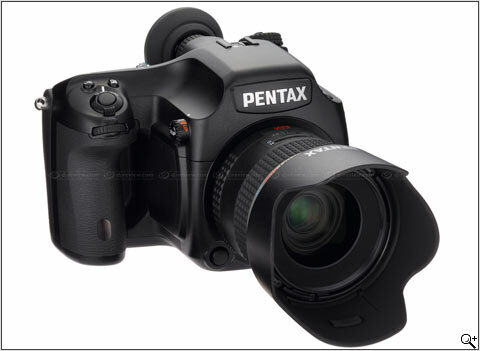 The PENTAX 645D will be available from early December 2010.